Assembled Dimensions: 17" Diameter x 24" HighThis simple and elegant birdbath is sure .. Assembled Dimensions: 20.75" Diameter x 28.75" High The Country Gardens Solar Bir.. Assembled Dimensions: 20" Diameter x 32.5" High The Kensington 2-Tier Solar-On-De..
19.25" D x 29.25" H. The Mahayana Two-Tier Solar Fountain has been designed for outdoor us.. Assembled Dimensions: 20.75" Diameter x 28.75" High​Creates a relaxing atmosphere i..
A dazzling piece of garden artwork. With three elegant tiers, its classic structure is softene.. The unique, inspired structure of the Portofino makes it a captivating addition to any garden or pat.. Assembled Dimensions: 20.8" Diameter x 34.5" HighThe Riverstone 2-Tier Solar-On-D.. Assembled Dimensions: 20.0" Diameter x 24.30" High​ Creates a relaxing atmosphe.. Create an outdoor oasis or sanctuary with quality fountains! Outdoor Furniture and Garden offers everything you’ll need to create an outdoor oasis or sanctuary on your patio, porch or anywhere throughout your yard. Outdoor Fountains can add a relaxing quality to yard, porch or patio, and we offer a large selection of quality made selections for your home garden. The Portofino is a unique and interesting fountain that will add a serene and peaceful quality to your patio or yard with its graceful style. For a more traditional look, we think you’ll like the Napa Valley fountain with its classic structure and appeal. 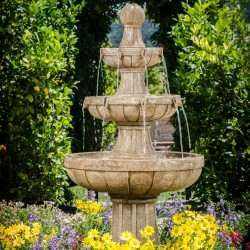 This fountain is perfect for a garden and decor accent or as the focal point of the yard.